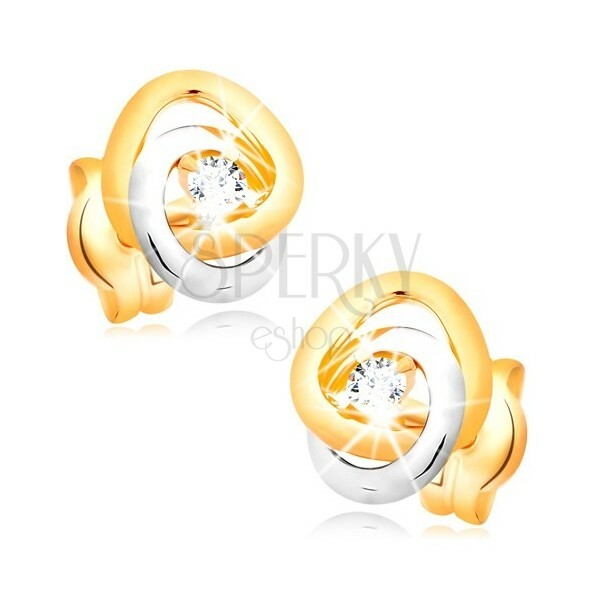 14K gold earrings - two interconnected bands, cut round zircon of transparent finish in the centre. By buying this product you can collect up to 61 points as a voucher of 12,20 €. Your reward points. 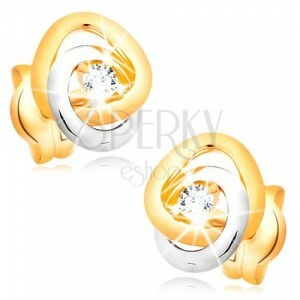 Combined 585 gold earrings consist of two entwined contours and zircon. Contour of yellow gold has a shape of triangle with rounded edges. The contour is decorated with layer of white gold and it has a shape of circle. Earrings have smooth and glossy surface. There is a glittery round zircon of clear colour gripped with four prongs inserted in the centre. Earrings have removable closure retained by friction.